Good morning; it's here - demo day. 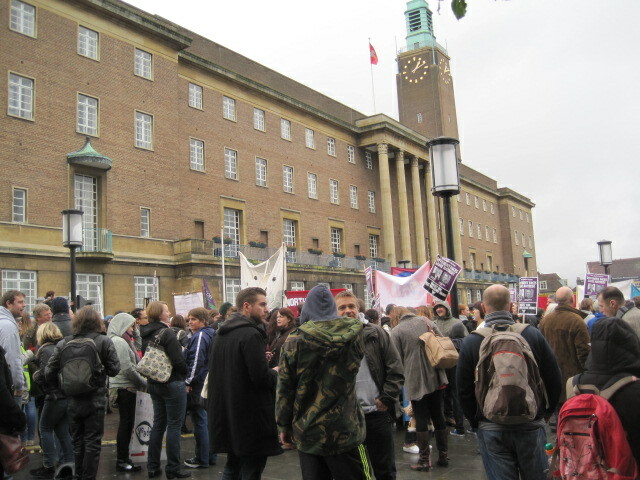 The day on which we tell the EDL in numbers, peacefully but with determination that they are not welcome in Norwich. I spent almost a decade in the Middle East, most of it working for an Arab airline based in a Gulf country. I lived and worked and travelled with Muslims, visiting almost all of the countries of the region and beyond. 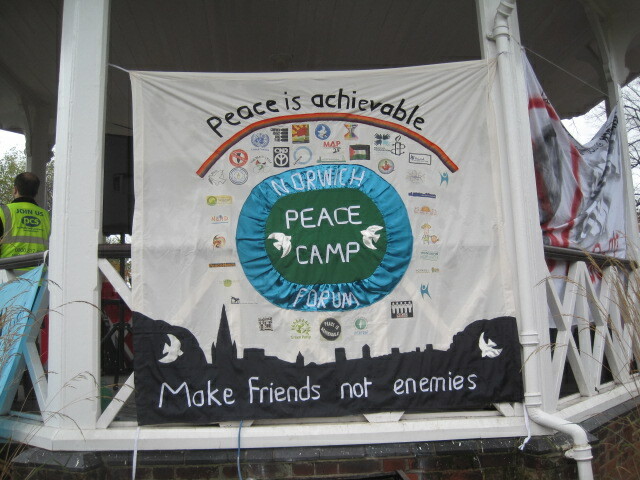 It was a time full of adventure and challenge that I will never forget, with a political education thrown in for free. Time has passed, and sixteen days ago I saw the representatives of two Jewish groups in Norwich sitting together in the same hall as the representative of a Norwich mosque and a representative of the Norwich Palestine Solidarity Campaign. 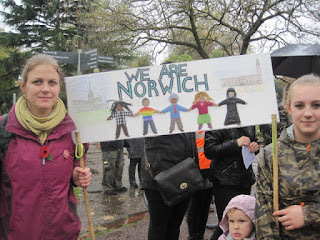 It was extraordinarily moving for me to hear a Jewish speaker alternate with a Muslim speaker at the We Are Norwich public meeting. It would be almost unthinkable in much of the Middle East to have such speakers together in the same room. 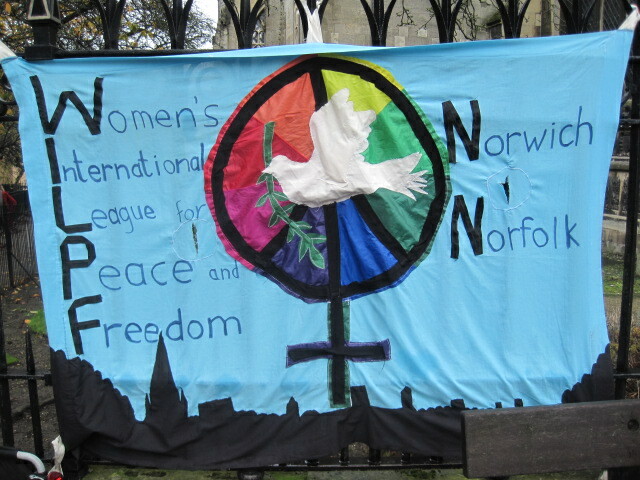 How wonderful then that something has brought together this astonishing event in our small city of Norwich. The messages from each speaker were similar - beware of those who scapegoat and blame a segment of society for all the ills of that society. Beware the bullyboys who speak and act in violent ways towards others. 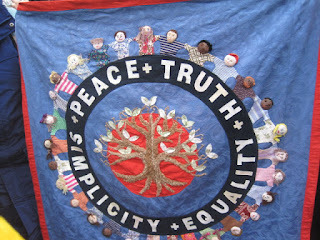 Remember history, and how small acts of cruelty and hatred and division can become a vicious evil. Beware the fascists. The Jewish and the Muslim representatives were brought together by a common cause, that is, in a resolute opposition to the policies of hatred of the far right, and in response to the threats of the English Defence League (EDL) to march on Norwich 10 November - tomorrow. 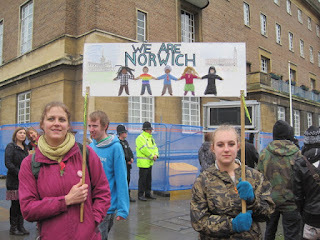 Representatives of all the main Christian churches of Norwich have already registered their objections to the EDL. 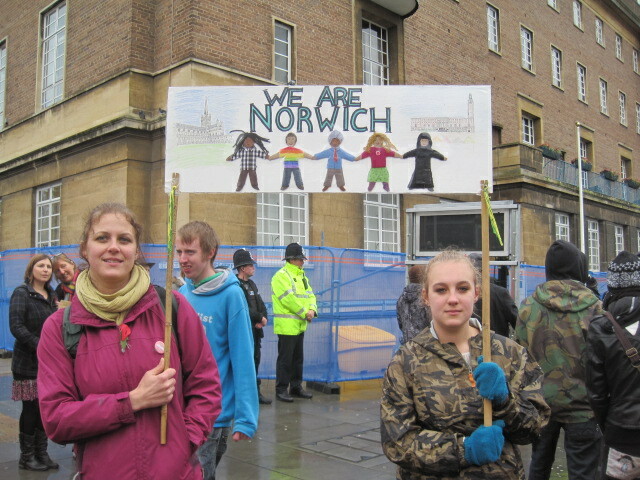 Representatives from the Norfolk Humanist Group have also expressed support for We Are Norwich. Opposition to the far right bigotry of the EDL has brought together the citizens of Norwich in all our glorious diversity. 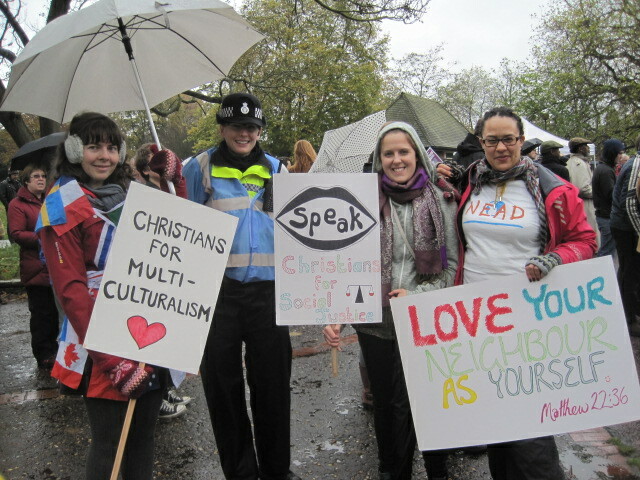 Not only the religious, but the political, with messages of support from all the major political parties. 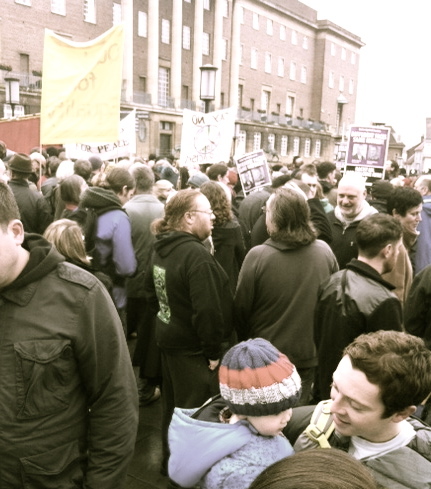 Representatives of huge political parties, and representatives from small local community groups. 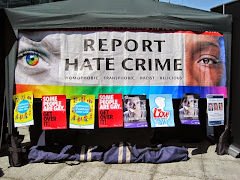 We are young and not so young; gay, straight, bi, and passed bothering; athletes and disabled; religious and irreligious; political and apolitical; students, trade unionists, housewives, professionals, priests, soldiers, artists, pensioners and labourers; people of every hue united in this rainbow coalition. Our main leaders teethed their organisational skills on the annual Norwich Pride events, and we are united in admiration for what Nick O'Brien, Julie Bremner and the Norwich LGBT group have achieved. 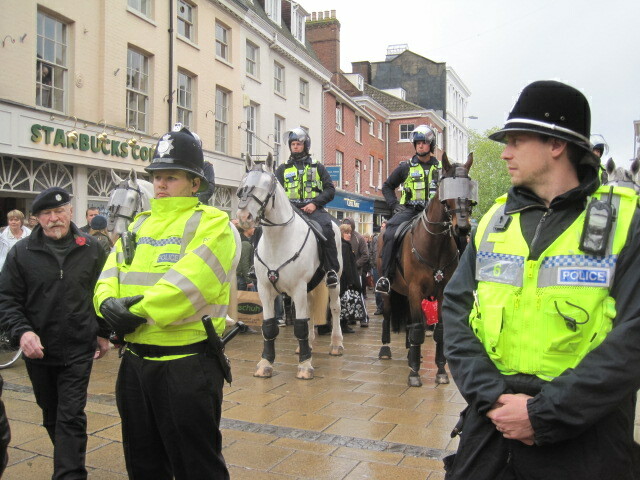 The EDL has held countless demonstrations across the country where they have rampaged through towns – attacking mosques, businesses and individuals. More recently it has begun to attack peaceful demonstrations, multicultural events and trade union demonstrations. Its leader Tommy Robinson, who has a string of convictions and was formerly a member of the British National Party appeared of a Channel 4 programme praising Anders Breivik, the fascist terrorist, responsible for killing 76 people in Norway. (Tommy Robinson is now in prison awaiting trial for allegedly travelling on a false passport). 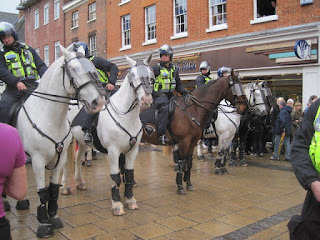 No rampaging for the EDL in Norwich tomorrow. I trust the Police, their superb planning and fencing, and I trust We Are Norwich to keep the peace. I am proud to be a part of this coalition and look forward to the celebrations tomorrow. 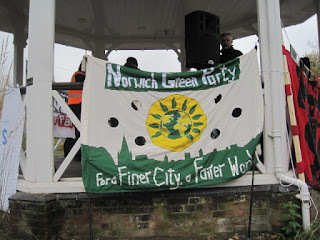 Looking forward to seeing everyone at Chapelfield Gardens at 11am on Saturday morning. 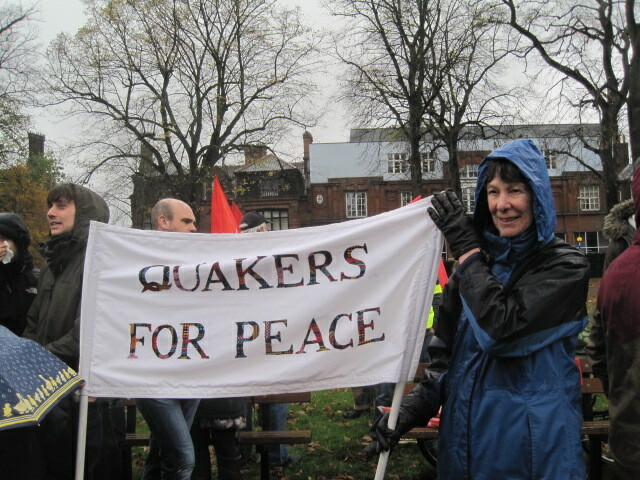 New groups pledging to support us every day. Disabled People against the Cuts have contacted us today and stewards will invite disabled supporters to move to the front of the march should they wish. Weather forecast looking good – we will have some brilliant acoustic music – Red Flags, ACivilianInvention, Jonathan Williams, Dandelion and the Rockets and loads of speakers – keeping very tightly to 3 mins each to warm everyone up. 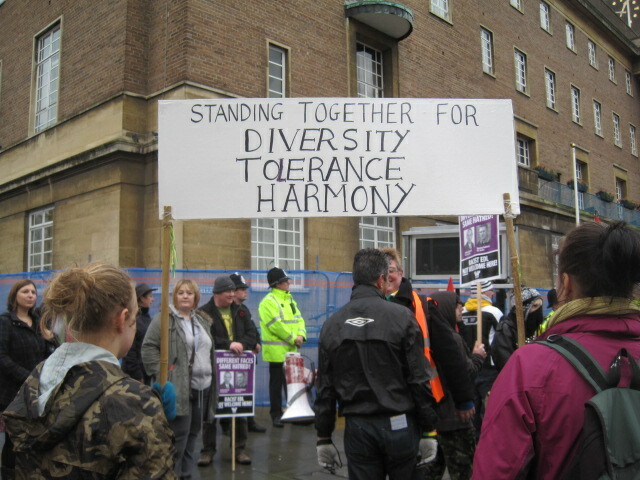 Then we will march peacefully to City Hall and drown out and demoralise the EDL with our chants, our diversity, our positivity, our unity. 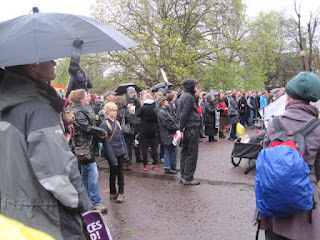 When we know that they have gone we will march joyously back to Chapelfield Gardens. See you all there. 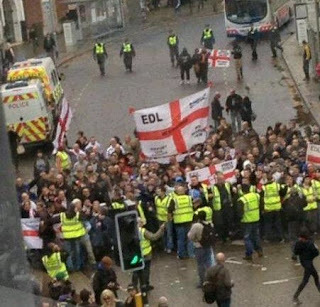 Just to head this one off at the pass: The EDL have put out a blog and a facebook post this evening saying that a group of four people giving out WAN leaflets threatened a war veteran in the city today. I know, as secretary who has been leafleting, have spoken to them since and have EVERY confidence that this did not happen at all. Desperate last measures. 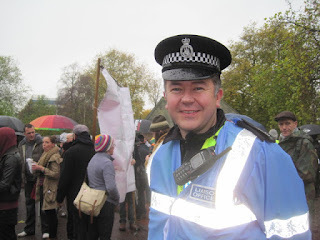 Had this happened – we can be sure there would be photos and video footage everywhere. 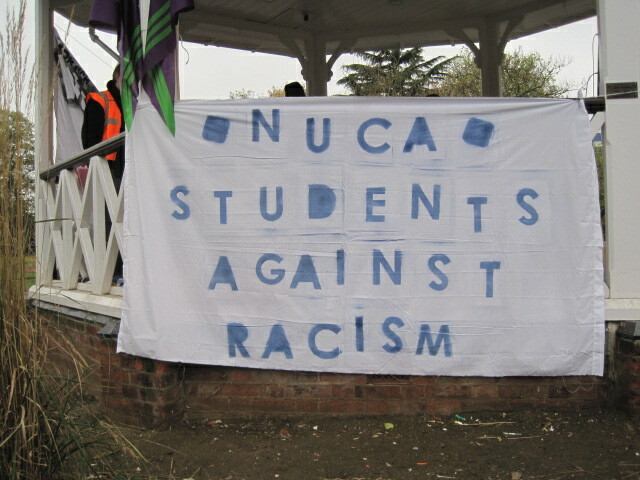 We are not the kind of organisation that needs to tell people not to chant racist slogans or bring weapons to demos. What a desperate attempt to smear our reputation. 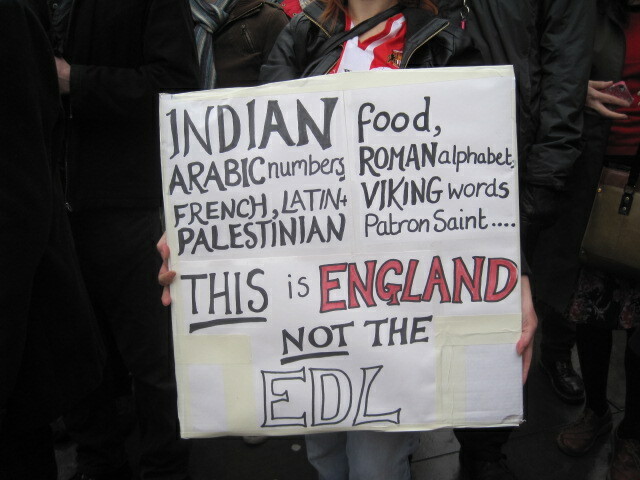 If the EDL can prove this happened, they need to go to the police and deal with it officially. Stay strong, stay calm. 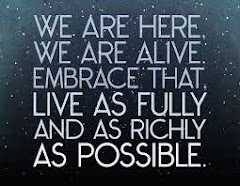 There are many, many more of us than them. A young artist called Lily and I have been leafleting together, and we have had absolutely no trouble at all from anyone. I would say 99% of those we spoke to were positive and supportive, and the ones who weren't were simply busy or preoccupied. And by the way, EDL, both of my parents and all of my uncles are/were WWII war veterans and my two grandfathers were WWI veterans. 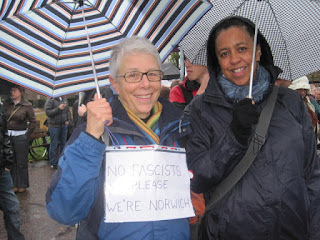 The same is true for many of the We Are Norwich group. 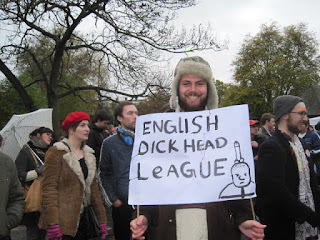 It is highly insulting of the EDL to assume we who oppose the EDL are not respectful of veterans. We remember those who served this country and fought against the forces of fascism in the past very well, probably much better than you do. I loathe the way you of the far right try to exploit sentiment towards the Armed Forces and seek to give love of our country a bad name. You started by attempting to bully three women in a fast food shop on Prince of Wales Road. You threaten and lie in the social media. You scapegoat fellow citizens and blame them for everything wrong. How dare you pretend it is freedom of speech that brings you to Norwich to cause such trouble, nuisance, expense, and loss of business? On the day before Remembrance Sunday too. Tomorrow we see you off. Peacefully, of course. 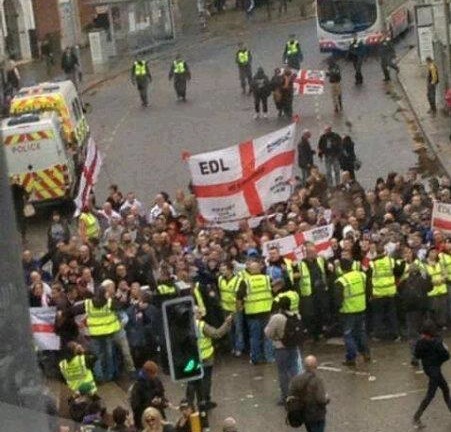 We outnumber you, we outsing you, we outpeace you and we see you off, you miserable bunch of bullying EDL bigots. 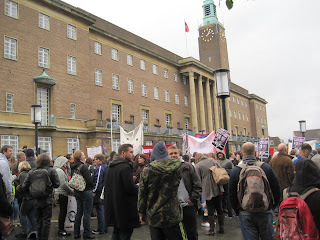 Earlier this year the English Defence League's East Anglia division decided they wanted a demo in Norwich to protest against the City's several hundred Muslims. After pressuring the leadership, they finally relented and an excuse to have a demo was sought. The best they could come up with was to support a reverend of a fringe church who had been banned from distributing anti Muslim hate literature in the market place. Such was the interest by leadership, their original date was scuppered to make way for the return to Walthamstow which never happened in the end. The reverend has been ostracised by all the other clergy in the city for his extremists views which closely reflect those of the Westboro Baptist Church in the United States, which in turn closely reflect those of Muslim extremists who they are supposed to be against. To put simply, he is a tea party type loon. However not many EDLers know why they are going and what the demo is all about. We spoke to several and they think that are going to shout abuse at Muslims, which considering few live in the city, they are going to be sorely disappointed. 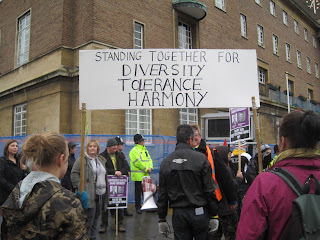 The Reverend Alan Clifford, leader of the The Norwich Reformed Church, is not just against Muslims, he also has it in for gay people as well which makes us wonder what the EDL's LGBT Division think about all of this and how many are attending. We also wonder how many of the LGBT Division who are attending, know they are going to support someone who thinks they are an abomination. Loving sexual relationships are to be confined to heterosexual marriage. Fidelity within marriage is the ultimate antidote to AIDS and other STDs." Like adulterers and murderers, homosexuals must repent of their particular sin if they wish to be part of Christ's Church and be saved. As there is no limit to the transforming power of God's grace and Holy Spirit, so those with homosexual tendencies may be delivered from them. Leaders of all the main Christian denominations in Norwich have spoken out against a march by the English Defence League in Norwich. 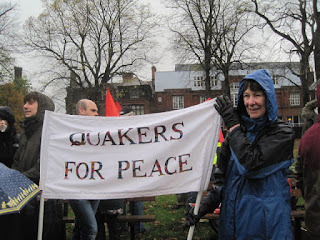 Church leaders from the Church of England, Roman Catholic, Methodist and Baptist churches, Salvation Army, United Reformed Church and the Quakers have united to issue a joint statement against the march. We have asked demo organiser, Anthony Bamford why they are supporting a homophobic reverend but each time he has dodged our questions. Bamford has previously been outed on YouTube when him and a gang of thugs videoed themselves intimidating two young female takeaway workers because the establishment that they worked at sold halal food. Please ignore any provocation and let’s get our message across peacefully. We need to show the city that we are not ‘racist thugs’ (or whatever else). 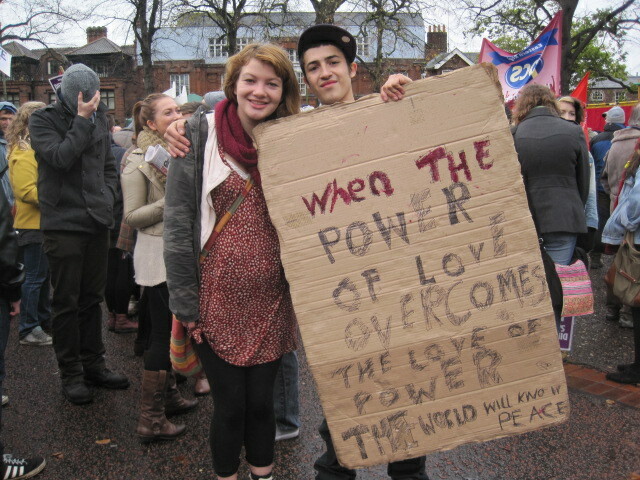 We can go to ANY city to get our message across and leave with as little disruption as possible. Strangely they forgot to advise that if any of their members are LGBT, they should probably not turn up for this one. 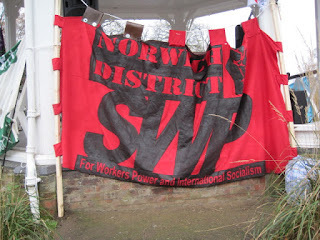 There seems to be very little interest in this demo amongst their Facebook pages, much like there was very little interest in the return to Walthamstow which saw around 80 drunks stood outside the Houses of Parliament looking cold and dejected. 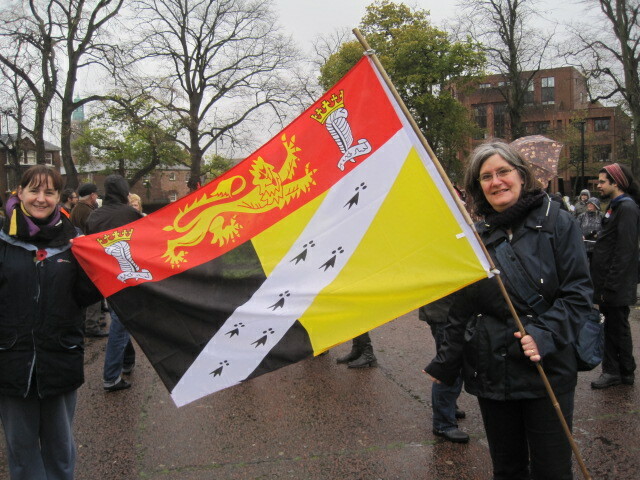 With Christmas coming and the fact that the English Defence League have already fleeced all they can out of them this year, Norwich is out of the way for many of them who will simply decide that travelling that distance to support a bigoted revered who many have never heard of, is simply not worth their time. The other reason few are likely to turn up is the fact that the next day is Remembrance Sunday and many already have plans to attend that event in London. 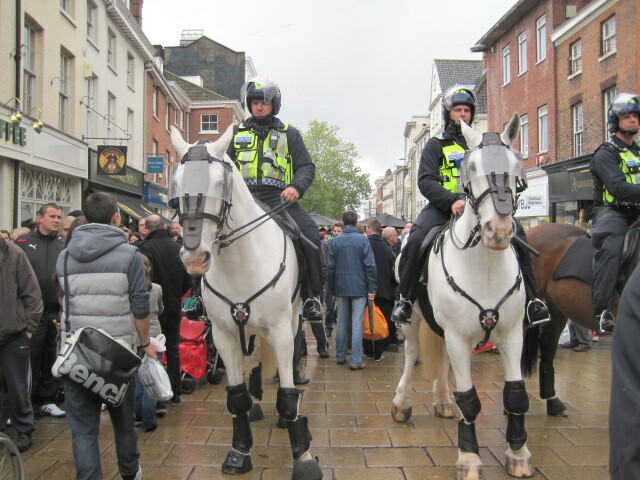 Last year they were mass arrested as they fought each other in a pub near the cenotaph and racially abused the staff. With demo numbers already looking bleak, things have taken a turn for the worse as it has been discovered one of Walsall Division's members has done a bunk with the £200 deposit for their coach leaving them either stranded or having to fork out £78 for a train. If the EDL organisers really do not want racists to turn up, they have a job on their hands because neo nazi and white supremacist leader of the Millwall Divisio, Trudie Toker, has vowed to turn up. She is a violent alcoholic who turned up at a school in Croydon and threatened some black children and their teachers. (Her Facebook racist filth is too vile to be reproduced on this blog). 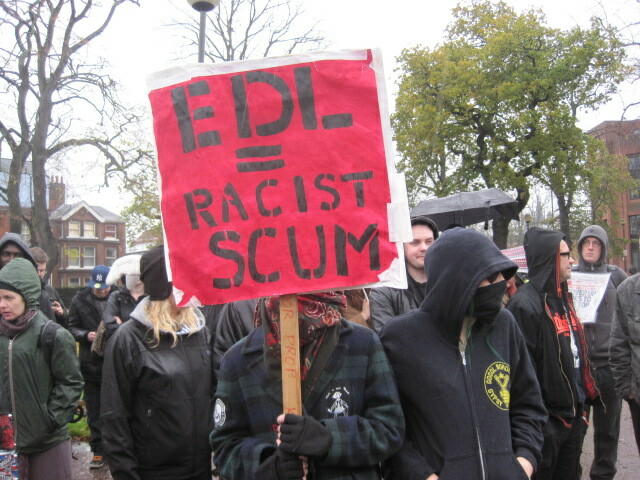 We have a poke around their groups and found this discussion between the organisers where they share their concerns that the EDL will be turning up and singing racist songs. 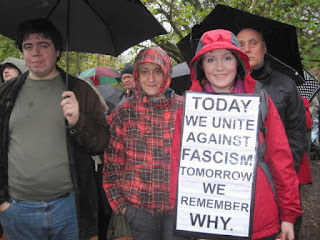 And here the EDL shamelessly exploit Remembrance sentiment for their own ends. A Norwich MP has attacked the English Defence League as “hate-merchants”, ahead of a march tomorrow which will bring parts of the city to a standstill. 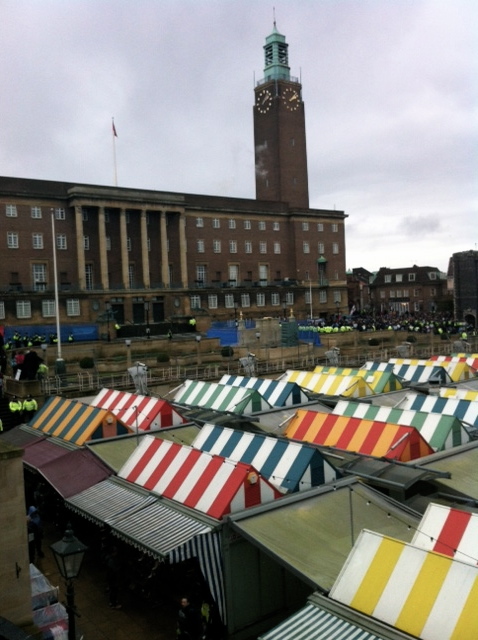 The EDL is holding the march to protest at Norwich City Council banning a preacher from a stall at Hay Hill for promoting “hate- motivated” leaflets. 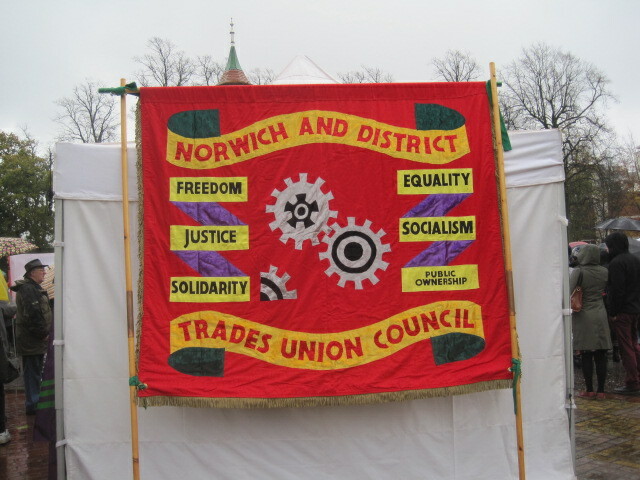 But its arrival has provoked strong opposition from trade unions and politicians. 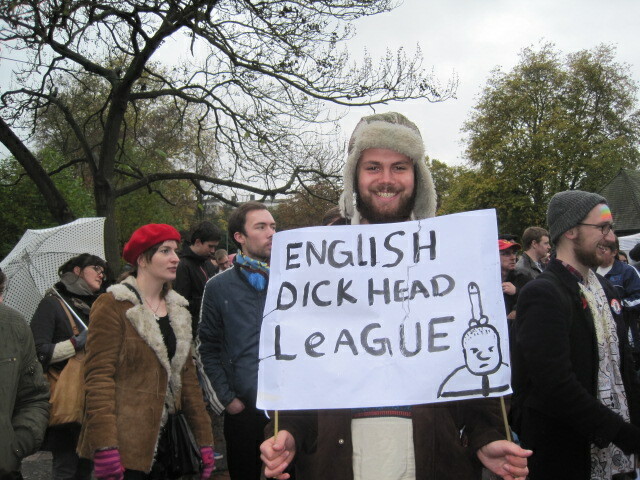 I do not want to see the EDL on parade in our city. 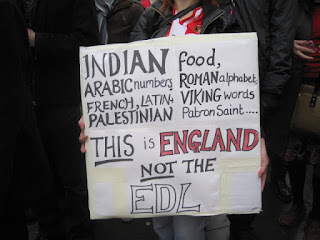 I believe the EDL to be disreputable, divisive, harmful, and violent. 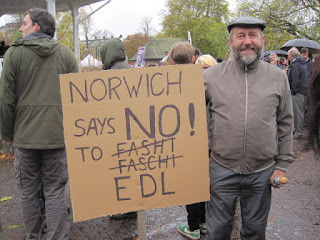 Hate-merchants like these have no place in Norwich or anywhere in Britain. I am proud of this country’s legal freedoms and rights to take part in peaceful protest, but do not want to see them abused, and Norwich dragged down, this weekend. So why are the EDL coming to Norwich again? 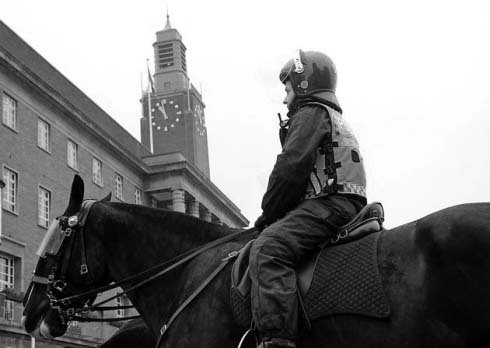 Police ready for Saturday's "many eventualities"